Some series struggle to keep the pace. Some series struggle to keep continuity whilst keeping the story-lines fresh. This is not that series. Each book seems to be different than the previous, each couple bringing something fresh to the series whilst slotting into the story arc seamlessly. I loved it and this book, being about two psy, was amazingly different. 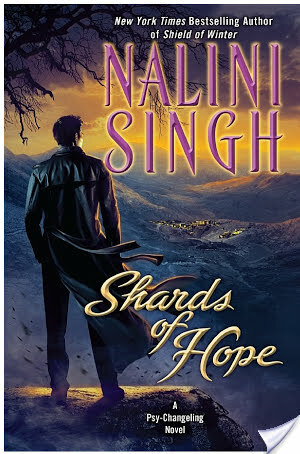 I actually think one of the books strengths is the dynamic between the Hero and Heroine and the way Ms Singh completely ignored the conventions of gender roles and just got on with it. The Hero wasn’t the all encompassing Alpha that will do anything to protect his Heroine and the Heroine isn’t the spunky backbone to the Heroes brute strength; If anything, this storyline is the complete opposite. Zaira was the star of this show for me and I loved it. Aiden became intriguing when we met him in Vasic’s book. He didn’t seem Alpha enough to lead the Arrows and so I knew there was going to be a massive secret (boy was I right!). This book introduces us to a man who is, quite frankly, as hard as nails but feels no need to show that power. It is his devotion to his squad, his faithfulness to protecting them all whilst protecting their mission that keeps the Arrow’s loyalty. He is like no other Alpha character in the psy-changeling series. He isn’t the physically stronger of the romantic coupling, but that doesn’t threaten him and he is happy to let her do what she needs to do to protect him. His only goal is convincing her that she is his partner in life (his commitment to this cause is quite beautiful to read…I was a bit weepy at points). Zaira considers herself fundamentally broken. She lives under constant fear of releasing her “beast” and believes that she isn’t good enough to be with someone like Aiden. She uses her physical strength to protect the man she considers hers but her emotional instability makes her push him away. Her fears are completely founded and the violence in her past made me wonder if she was the woman for the lovely Aiden. He, however, is completely sure that she is his other half and they spend the entire book in a dance, both of them knowing that they consider the other “theirs” but only one of them happy to accept that that feeling goes both ways. My heart broke for her because she truly believed that she didn’t deserve to be anything other than silent. This book is jammed to the rafters with other stories but it is, at its core, a love story. I loved the way the H/h complimented each other, strong in different ways but equally Alpha. Their story is heart-breakingly beautiful and is well placed within the series. I wondered at the end of the last book how the silent would cope with the complete annihilation of their way of life and now, it seems, we are about to find out how. With so many new characters introduced in this book, I can’t help but think exciting times are ahead in the Psy-changling world.